Kumudini: the sacred lotus Kumudini is a Bengali word which means "Sacred Lotus". Our logo bears this name that cares for the Education, Health and Environment which was the dream of our founder. Kumudini is the name of the mother of Rai Bahadur Ranada Prasad Shaha, who lost her life from tetanus infection during childbirth. He was only seven years old when his mother died and it was a common fate for most women in contemporary rural Bengal. Since then he dreamt of establishing a hospital for the poor so that people, especially women, would not suier from lack of medical treatment the way his mother did. Provide free and quality medical care for rural people. Spread the light of education among women, especially the under-privileged girls. Offer the scope of economic emancipation for women to improve their status within the society and their households. Work towards and promote environmental bio-diversity and harmony. Develop skilled manpower that can contribute towards the economic development of society. Create a peaceful society by promoting mutual tolerance and self-reliance. The organisational structure of Kumudini Welfare Trust of Bengal (BD) Ltd (KWT) is simple and authority rests solely with the Board of Directors. 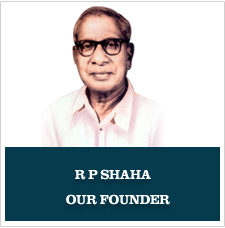 Rai Bahadur R P Shaha was the first Managing Director. His daughter Mrs Joya Pati took over the responsibilities as Chairman and Managing Director soon after his disappearance during the Liberation War of 1971 and continued to serve the Trust in this position till 1999.The present Chairman and Managing Director Mr. Rajiv Prasad Shaha, grandson of R P Shaha took over the responsibility in January 2000. The Trust's business endeavours are primarily targeted to match the expenditures borne while maintaining the Hospital and the Homes at Mirzapur, along with other public welfare initiatives throughout the country. This has been included in The Trust Charter. The Charter also states that it shall not be used for personal profit or gains. Spread across a large 82 acres of land the Narayanganj compound is situated on 11 the bank of river Sitalakhya. Income generating units like jute bailing press and warehouse, garment factory, pharmaceutical industry, handicraft industry etc are all located here. Head of these organizations operate independently while being individually accountable to the MD of the Trust. KWT at Narayanganj engage around 1500 employees and approximately 5,000 seasonal workers. The complex at Mirzapur is somewhat larger than that in Narayanganj. Located on approximately 100 acres of land, it houses the Hospital, the Bharateswari Homes, the Medical College, the Nursing School, the Nursing College and other institutions, each having separate administrators. The Director of Hospital, Principals of Medical College, Nursing School and Nursing College, the Homes, run their respective institutions independently. The overall responsibility rests with the Administrator, Kumudini Complex. Total number of people residing in the Complex including patients, nurses, teachers, students and employees is around 4000. Although devoted to the sole purpose of philanthropy, the management of each of the endeavours run by the Trust are governed by a positive and fair business attitude and with a goal for earning revenue which can then be utilised for the services rendered by the Trust. Kumudini's material progress is much more than huge buildings, commercial ventures, financial assets etc. Kumudini provides new understanding about the community and its possibilities.